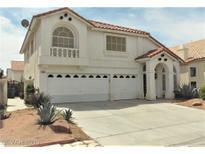 Below you can view all the homes for sale in the Silverado Spencer subdivision located in Las Vegas Nevada. Listings in Silverado Spencer are updated daily from data we receive from the Las Vegas multiple listing service. To learn more about any of these homes or to receive custom notifications when a new property is listed for sale in Silverado Spencer, give us a call at 702-323-5939. Dont Let This One Get Away! MLS#2090930. Resolution Realty. Newly renovated kitchen, lots of pot shelves, a 6th bedroom upstairs that can be converted into an office space or media room, a loft and a spacious balcony overlooking the pool and rear gardens. Show and sell! MLS#2087944. Paragon Premier Properties. Common area maintenance are part of the HOA. MLS#2069782. Opendoor Brokerage LLC. You Cant Replace This Best In Class! MLS#2037211. Platinum R.E. Professionals.